The Soho original for flawlessly executed tapas - part restaurant, part theatre, and with a no-reservations policy that means you're almost certain to queue. Please note, Barrafina has now closed. 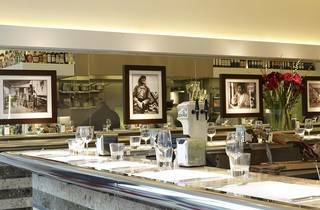 A new Barrafina has opened on Dean Street. Time Out Food & Drink Editors, April 2017. If proof is needed that tapas is fashionable, the queues at Barrafina are it. And there will be a queue: bookings aren’t taken and hopeful diners can expect to wait at least an hour, any evening of the week. Yet seldom does anyone leave Barrafina disappointed. The place is part restaurant, part theatre, in which diners play a part. Your role begins the moment you join the line for one of the 20 or so stools around the L-shaped bar. Nibbles and drinks are served as you wait – service is excellent. The chefs, stars of their stage, shout out orders, grill, fry and plate up their creations. The owners, brothers Sam and Eddie Hart, know a thing or two about Spanish food; their mother grew up in Mallorca and they spent summers there as children. Barrafina’s menu is studded with Mallorcan and Catalan tapas dishes, such as juicy, crisp-skinned grilled chicken thighs served with exemplary romesco sauce, and coca mallorquina (Mallorca’s answer to pizza), piled high with spinach and studded with pine nuts and raisins. A main course-size dish of tender octopus was given extra zip by capers, and toast with alioli was a simple, garlicky treat. Wines by the glass showcase some of Spain’s best modern winemaking. Great tapas and atmosphere but the queues are very long, any day, any time, and it spoils the experience somewhat. Saw Bill Murray of Hollywood fame the last time I was here and he seemed to be enjoying the Rioja and Jamon! It almost made up for the 45 minutes of shuffling along in the queue. Deserves a better review from TimeOut, in my opinion. As described below, "consistently excellent". Do you have to queue? Yes. Is it worth it? Hell yes. I had read about this place and was well prepared for the wait that ensued. I queued outside for around 20 minutes and then inside for another 5 but it truly wasn't too bad. When you are inside, they stand you at a bar and take your drink order. The atmosphere is really buzzy, with loud voices emanating from the kitchen and the surrounding bar seating. We ended up sitting outside which was an experience within itself. If you do sit outside, be prepared for a lot of homeless people asking for money, we were probably approached every fifteen minutes. I wish I got our waitresses name as she was truly so lovely. We ended up ordering the prawns, the octopus, the fries, the pan con tomate, the ham & cheese croquettes and the bomba. Oh my word, every bite was absolute heaven. The service was great, the food was great, the drinks were lovely and the price wasn't too bad either. We ended up sitting there for four hours and even though they were super busy they never rushed us off the table. Will definitely be coming back! Oh my - the food here is so good! It is worth the hype - plus the staff were super friendly and the atmosphere was buzzing. It's a bit on the expensive side, but the quality of the food is excellent. My personal highlight was the tortilla - unlike any i've had before (so juicy), and the cold meat platter is worth ordering too. Keep some room for the cheese platter at the end. Make sure you arrive early - I arrived at 6pm on a rainy Wednesday evening and only waited 25 minutes, but by the time I left the queue was huge! I can't wait to return. Ok so first things first - this flagship Barrafina has moved from Frith Street to Dean Street so if you're waiting in a queue on Frith you may be waiting a while longer than the average Barrafina guest... yes it's another no bookings restaurants (one of the originals) but boy is it worth the (1.5 hours on a Friday night) wait! Half the fun is actually the anticipation of a seat - the people-watching is great in the evenings and they'll even serve you drinks and snacks whilst you wait for your seat. Top tip - always sit at the counter: you can watch the chefs make your food, have a looksie at your neighbours' orders and the general atmosphere is buzzy and fun. Logistics aside, the food never fails to impress: hands down the best pan con tomate in town - I don't know what magic they sprinkle on top but it works and is possibly my favourite dish on the menu... apart from the croquetas, and the pluma (both cooked to perfection), and the tuna tartar (oh my god- the TUNA TARTAR!). We topped the evening off with poached pears and a complimentary glass of sherry - the perfect ending. I actually don't think you can go wrong in Barrafina. There's a reason there are now three branches - the quality control is second to none - dishes were run past the head chef (checked by sight and taste) before being served, the service itself was on point and I've always had a great time whenever I've eaten here. I would say this is my favorite location of Barrafina so far! I believe this is the original location. All the food across all locations are similar. I always order their classics: acorn fed pata negra, croquetta, empanadas, brioche toast, pork belly and etc. It's a good place for a date night. I do think it's a little pricier than what I'm used to, especially comparing to the Basque country. Barrafina still remains the best tapas place London has to offer. It still is perennially popular and takes no reservations. We arrived at 5 pm (the opening time) on Friday. Well, my friend did. I was literally 3 min behind and as I rushed in out of breath the host was already about to give away our 2 places at the bar to the next in line. The place fills up immediately, so if you happen to arrive at 5.05 pm, forget it. So there’s that. It’s a medium sized place for Soho (although this is a bigger venue than the original Barrafina) with a long bar and a few smaller tables. It’s well lit and you can sit and watch the multiple cooks doing their magic in fright of you. The regular menu features all the classic tapas and there are specials on a slab of blackboard that one of the waiters explains to you in heavy Spanish accent. We went for pardon peppers, tortilla, gambas al ajillo (that’s lots of fried garlic), octopus with capers and croquettes with peppers. We drank excellent Txakoli from Gesturia (light and crisp and effervescent, similar in style to Gruner Veltliner, that was perfectly acidic to cut through the oil that is generously used by Barrafina chefs). We finished the meal with turron (definitely share, it’s a rather big portion). The food, and in particular paprika and oil marinated octopus (so smoky on the outside and melt in your mouth on the inside) was excellent. I would normally cringe at the idea of no reservations places. And the people waiting inside to get your seats once you are done at times feel like vultures hovering above. And the prices are not cheap. And it’s so busy that sometimes getting the attention of the waiters is a struggle (don’t be fooled - there are multiple people behind the bar, but the chefs don’t take orders, no no no). And the food is actually rather oily. But it just tastes so very very good that it’s 5 stars from me each time. The best tapas in London. Sat outside on a sunny summer lunchtime. Great food, helpful staff - life is not much sweeter. For a pre or post-theatre dinner this is perfect as getting there early or late is the key. Getting there just before 6, we only had to wait 20 or so minutes, which is perfect as you can get nibbles or wine while you wait. The best is a group of 2 or 3 as counter seating with a few outdoor tables is the choice here. A tip is to go with people who have the same palate as you. I'm a pescatarian so although I couldn't try some of the delicious looking dishes, my meat eating friend kindly agreed to share dishes with me, commenting she'll have to come back to try everything else. It's a tad expensive, but well worth for the quality of food. Six or seven dishes to share between two people came to 50 quid, but I was well fed and full by the end. Although there was clearly a line, we didn't feel rushed or hurried. I totally understand why TimeOut named it it's top 100 restaurant of the year. Great spot, wonderful service and very yummy! Go early and expect a bit of a wait, but seriously worth it! Apart from a disagreement about what temperature white wine should be served, this was a very enjoyable meal experience. Delicious selection of tapas and very enjoyable to sit at the bar and watch everything being made (as long as one doesn't engage in discussions about wine...). Loved it - enough said. Great food, atmosphere and wine. I still loved it despite having to queue for nearly an hour and a half. Great quality tapas but because you can't book in advance it's really hard to get a table which can be quite annoying, nevertheless it's worth to wait! Best tapas out of Madrid! If you are looking for a private dinning room experience... Look no further. 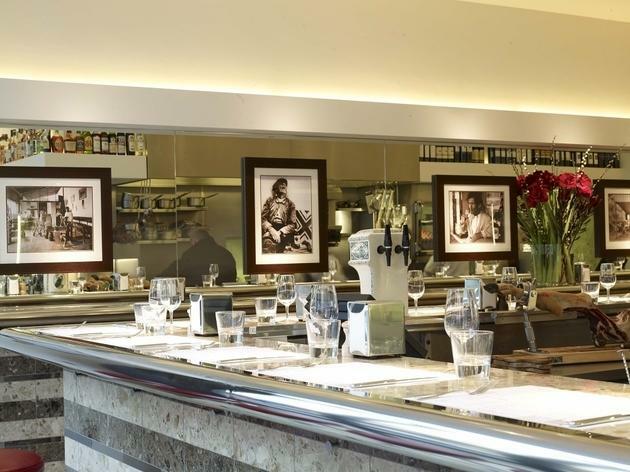 Barrafina is the perfect place to celebrate your birthday. Tucked away downstairs from the busy resturant is this amazing dinning room that can accommodate 12-32 guests. It has a private bar, open plan kitchen and surrounded by wine cellars if you want to hand pick your wine to your cuisine. There are a number of feasting menus to choose from to suit any budget and taste with free flowing wine. Check out the menu I went with in my pictures. We had soooo much food and got to try so many of the amazing things on the menu. I hosted my 30th birthday here and the staff were absolutely lovely. I had a present table and my friends brought balloons. No need to do a table setting as they do it all for you even with place cards. They allowed me to leave my gifts and cake and pick them up the net day so I could go out dancing afterwards with having to carrying everything. Good things come to those who wait - and boy oh boy will you have to wait, no less than 1 and half hours to get a table here. It's not even the case that the early bird get's the worm - I arrived at 5.30, and still had to wait until 7! This did however mean that I got to spy what Gizzi Erskine was eating on the table next to me though.... We opted for one of the cheapest wines, but this was still delicious. When my mother and I were eventually seated we went for some pane con tomate to start, which exceeds even the most imaginative expectation of tomatoey bread you might have. We then shared the prawn and mushroom fritatta, the rabbit shoulder, some Iberian ham and then the donuts for pud (articulated so Authentically no?). My only complaint was the pud - which did not compare with traditional Spanish churros. Every other mouthful was a flavour sensation, and Gizzi certainly agreed as she jovially selfied away all evening. Simply the best Spanish food around, amazing wine selection and always a great atmosphere, would go here again and again. Excellent tapas in a great location. Yes the queues can be bad but once you've got a seat the wait is worthwhile. It's got a great buzzy vibe and the pan con tomate is excellent! Excellent food, great selection of fish. I would recommend sitting towards the entrance as you get a great experience. Be ready to wait though as its first come first served. Firstly everyone needs to go here expecting to queue. If that's going to bother you, even if the food is delicious then this isn't for you. The queue moves relatively quickly so if you're happy to wait then you're in for some of the best tapas London has to offer. Everything was so delicious paired with really good wine. Service was really friendly and our waiter had a great sense of humour. Would eat here again in a heartbeat. Overrated! Food is good but not excellent. Croquettes were too cheesy and salty. I love cheese but the cheese flavour was too strong in this dish. Chorizo with potato and watercress also too salty. Tortilla with gravy?! reminded me of Sunday roast not days in Barcelona. Oyster ceviche was excellent as was the Iberico ham (but super expensive at 18.50 a plate). Friendly staff but let down by the food. Some of the best spanish food you can get in london. It's not for everyone - it's really rowdy, and you often have to wait for ages to get a table if you get there after 6.30pm(! ), but this is what I love about it and I have been several times over the last couple of years. The food is consistently excellent, especially the fish which changes daily, and it has great staff who always seem to be enjoying themselves. if you are precious about bustling and atmospheric places and want a quiet meal, go to tapas brindisa on broadwick street - completely different experience and vastly inferior in my opinion. Buzzing place with excellent Michelin star tapas. We visited the Frith St branch again for dinner on a Monday night at 8pm in the hope that it would be quieter (visited past 10pm at the week-end and did not manage to seat before closing, just got to order smaller dishes and wine standing) but we still had to queue for about 1h30 on the night (although you do get told the waiting time when arriving though so it's up to you). The queue looks quite disheartening at first but is made more bearable as you can order drinks and snacks while you wait. I would not go with more than three people (two is ideal as most seats are at the bar). We started by ordering some perfectly chilled and balanced dry Verdejo white wine and snacks. The pan con tomate and ham croquetas are sumptuously rich and deeply flavoured. Once seated you are not rushed and get to truly enjoy the full food experience. Our waiter was friendly and knowledgeable describing dishes in detail to us before ordering. We opted for a selection of tapas from the various categories (fish, meat, tortilla etc..) Every single item had the consistent quality and depth of flavour of top ingredients and care. The octopus capers was particularly mouthwatering and well balanced, warm, juicy and tender, the Chipirones (fried baby calamari) were nicely salty,garlicky and crunchy (although maybe a little touch too salty), the Morcilla Iberica (a type of spanish black pudding) with quail egg that my partner ordered was a perfect balance of seasoning and acidity and, although I am usually not a great fan of black pudding, we ended up almost fighting over the last mouthful. In the end we felt our patience got rewarded, we'd forgotten the wait and and had a truly enjoyable night. The food is the type of beautiful food that makes you happy as you sip wine, chat and laugh surrounded by a warm and busy atmosphere. It's michelin star excellence in an informal laid back setting. Make sure you're in no rush and treat yourself to an exciting tapas experience.